Ruben Guerrero Sr. also known as “Maddog” to the professional boxing world started boxing as child in 1964 with his father and later as an adult trained his son Robert “Ghost” Guerrero to become a six-time world class champion boxer taking him to the highest caliber of competition, fighting highest profile boxing champion in the world Floyd Mayweather Jr. Ruben Guerrero currently trains two-time world champion boxer Oscar Escandon from Columbia in Gilroy, Ca. 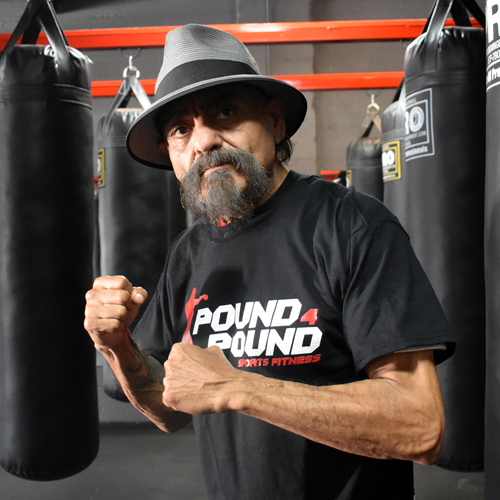 The sport and art of boxing have always been a major part of Ruben Guerrero’s family life and he lives to share his knowledge to empower people and train champions. Train with Ruben and learn the fundamentals and techniques of boxing at Pound 4 Pound Gym. Contact the world boxing champion trainer Ruben Guerrero direct to book your next personal workout session.